In April of 2004, Kidrobot debuted their Dunny form at the Toycon Hollywood event in Hong Kong, followed a month later by the Dunny, Series 1 offering. At this point in history, Visionaire had an eponymously named gallery in New York City, one that frequently featured pieces by their contributors as well as special collaborations and independent art projects. To commemorate the birth of the Dunny vinyl sculpture, Kidrobot and the Visionaire Gallery partnered for an exhibition, showcasing fifty artist’s hand-embellished works on roughly 20″ tall versions of the rabbit-like shape. Titled The Dunny Show, which ran from May 17th through July 17th of that year, Visionaire was represented within the exhibition by their Creative Director, Greg Foley. 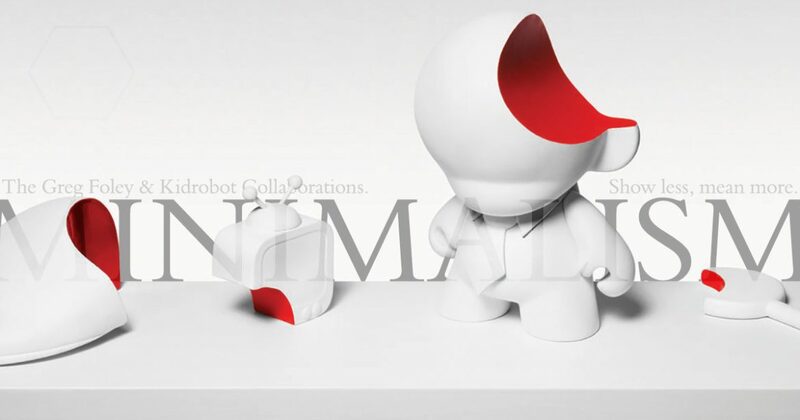 For November 2004’s Visionaire issue #44, Foley designed a sculptural form that was produced by Kidrobot and packaged in two limited collections, the Red Set and the Black Set. Each comprised of five factory painted figures, Visionaire enlisted fashion designers to conceive the decorations for the forms, namely Domenico Dolce & Stefano Gabbana, Jean-Louis Dumas (for Hermès), Viktor Horsting & Rolf Snoeren, Marc Jacobs (for Louis Vuitton), Karl Lagerfeld, Alexander McQueen, Miuccia Prada, Hedi Slimane, Valentino, and Donatella Versace. Limited to an edition of 2000 for each set, this package also included a model kit-like blister of accessories: a martini glass, cell phone, flower, and camera, all of which could be held in the Foley designed anthroporphic figure’s hands. Described by the company as “one of the most highly sought-after Visionaire issues ever”, it wasn’t surprising that they opted to partner with Kidrobot on a follow-up. Once again using Foley’s original shape as a base, ten more designs comprised the Yellow Set and the Blue Set, which were similarly limited to editions of 2000 each. Released in April of 2005, this Visionaire issue #45 was subtitled “more toys” and contained works decorated with designs by Giorgio Armani, John Galliano, Jean Paul Gaultier, Gucci, Rei Kawakubo (for Comme des Garçons), Christian Lacroix (for Emilio Pucci), Helmut Lang, Maison Martin Margiela, Stefano Pilati (for Yves Saint Laurent), and Vivienne Westwood. Even though this “became an instant collector’s item”, according to the company, Visionaire would not partner with Kidrobot again. But Greg Foley would. The Munny Show was a one-day only event held on November 3rd, 2005 at Kidrobot’s three then-existing stores, in Los Angeles, San Francisco, and New York. For the latter, Foley created an assymetical piece on the roughly 7″ tall shape, a fantasticly minimal evolution that left the sculpture and its accompanying accessories undecorated aside from an interior red exposed through cleanly rendered, curved slices. While those attending the event were invited to decorate their own Munny pieces, works by professional artists, like Foley, were auctioned off as a charity fundraiser. And, for several years, this would be Foley’s final art piece on a Kidrobot produced form. From November 12th through the 15th, 2009, the Munnyworld: Custom Toy Exhibition was displayed at The Eloquent Delinquents Gallery in New York City, timed to coincide with Kidrobot debuting four new forms in the Munny World line. And one of the over sixty artists participating in the event was Foley, the head of his approximately 18″ tall Munny contibution having been halved, a perfect plane of yellow filling the void. But this would be the artist’s final piece done in conjunction with Kidrobot, perhaps as he felt edged out by the bevy of opulent, maximalist designs that cluttered the landscape. Of course, in retrospect, impeccably executed minimalism like Foley’s creates timelessly classic works of art.